Hi, it's your friend Holly again. Do you know what the most serious and dangerous disease is that's about to have a huge outbreak tomorrow morning? Well, it's called the "Mondays." Symptoms include: inexplicable anger, extreme fatigue, and the desire to throw random computers through the nearest window. While the only known cure for a case of the Mondays is the weekend, I am about to share a recipe that will dull the pain significantly. 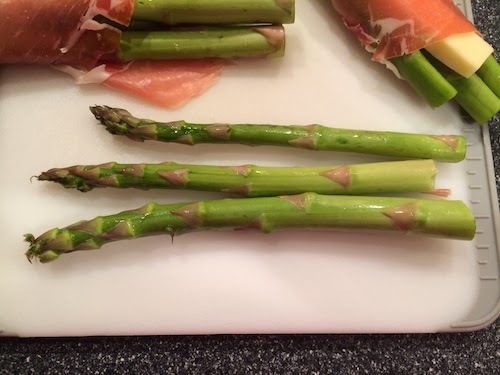 Follow along with me here: Asparagus, cheese, bacon, AND (yes AND) prosciutto. 4. Wrap each cheese and asparagus bundle with a strip of prosciutto and then wrap a strip of bacon around the bundle. Try to cover all of the cheese and asparagus with either bacon or prosciutto. 5. Place the wrapped bundles on a broiling pan and then place in the oven. Cook for 15 minutes, turn the bundles carefully with a pair of tongs, and then cook for another 5 to 10 minutes. Check the bundles frequently to avoid burning. 6. Serve your asparagus bundles with your favorite alcoholic beverage and be glad that Monday is over!